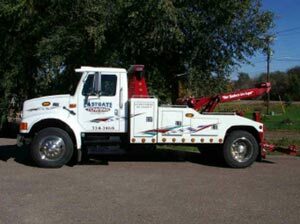 Eastgate Towing & Storage Inc.
For over 40 years, Eastgate Towing & Storage Inc. has been assisting the drivers of Sioux Falls, SD with all their towing and roadside assistance needs. If you’re stuck on the road, we’ll make sure you and your car are safe, secure and out of harm’s way. Accidents, dead batteries and stalled engines happen to every driver at one point or another. When it happens to you and you’re stuck out on the roads and in need of towing in Sioux Falls, SD, you want a towing service you can count on for quick and efficient help. Eastgate Towing & Storage Inc. is proud to have been that towing service for hundreds of customers every year since 1973. When you’re stranded, our team of nationally certified towing professionals will tow your car, motorcycle or motor home to a place of your choice. If you don’t have a space for it, we can also store the vehicle for you until you and your insurance decide what to do with it. No matter the time or day, our 24-hour towing service ensures that we’ll always have you covered. We offer 24-hour and emergency towing services. Our nationally certified towing professionals are respectful and careful with your vehicle. We can store your car for as long as you need. We have over 40 years of experience serving the Sioux Falls, SD area. Our prices are always fair and reasonable. "We were involved in an accident on our way home to Illinois from vacation. This towing service went above and beyond for us in towing all o..."
"Their hookers are legal! Great service, the guy who came and helped me out was super nice and he was quick to get me off the interstate. Bei..."
"Good people willing to help in emergencies. Never had any issues!" "Very professional company. Driver was courteous and professional. Reasonable time frame." "Always available and always get the job done with great drivers"
We’re proud to call ourselves the friendliest and most efficient towing professionals in Sioux Falls, SD.